I was given this book to read by my colleague. He has recommended books for my edification before and I greatly appreciate this gesture. Over the past couple weeks I have been able to digest this book section by section. I have to give the author only 3 out of 5 stars for the actual composition of this book. While it is extremely well reasoned, I believe the points could have been articulated in a clearer, more organized manner. This is possibly due to his perspective as a sociologist writing on religion. However, his intent was clear: Smith began with the problems of Biblicism and continued toward (not a formed conclusion, but, rather, the beginning of a discussion) a better understanding of the Bible within an evangelical context. In addition to these nine points, Smith argues that there is an unstated "Handbook Model" of reading scripture that pervades Evangelical Biblicism. This is seen by a simple stroll through the Christian Bookstores and noting titles like: Cooking with the Bible: Recipes for biblical meals, The Biblical Guide to Alternative Medicine, Biblical Psychology, & Gardening with Biblical Plants. In essence, the Bible is understood to be an authority on everything it covers, therefore opening God's credibility on every front under the sun. The problem with this outlook is something Smith calls Pervasive Interpretive Pluralism. In short, you can give four evangelicals a single passage of scripture and potentially get four different interpretations of the passage. The problem here is that these outcomes are inconsistent and—as highlighted in the title of his book—actually impossible given the theory of biblicism. It should not happen. Yet, it happens all the time. Particularly among the educated biblical scholars. Consider that Christian Bookstore again. In the book, Smith lays out the titles of over thirty "Four Views" books. That is, four different interpretations of biblical doctrine. These include four views on baptism, Christ, Hell, Divorce & Remarriage, Eternal Security, etc... This should not be. Smith continues to address the typical responses which, no doubt, my readers currently have in their minds. In fact, you (my reader) may have already dismissed the problem posed by this book by your own rationale. Please note that Christian Smith addresses each response and deftly shows how their arguments do not hold up. In essence, most arguments are actually a deviation from biblicism. Smith proposes a few ways to read the bible that might be more in tune with evangelicalism as a whole. His main potential solution (though, admittedly, not a complete solution) is a Christocentric reading of scripture. In other words, Christ is the main point of scripture. Everything else either leads up to him or stems from him. Even though most evangelicals will nod their heads and claim that they actually do read the bible Christologically, it is clear from the literature that they fall short in practice. Other potential solutions include a redefinition of our beliefs into a tier system. There is dogma, doctrine and opinion. Dogma is the small circle of common christian beliefs. Doctrine is the slightly larger circle that includes assembly distinctives but are not necessary for a Christian Classification. Finally, opinion is just that, an opinion that can find deviations within a denomination. This paradigm allows for disagreement and unity within the same umbrella of christendom. This is just a taste of what you will find in this book. I had some real problems with this book. I kept arguing with him in my head. Going in, I felt that I was essentially an open-minded biblicist. I come from a tradition where biblicists abound and I grew up believing a lot of these things about scripture. Yet, after reading this book and analyzing my own arguments over the past few years I had to come to the conclusion that I am no longer a Biblicist. I still respect the Bible as God's communicative tool for us to learn about his nature and will. Yet, I do not read it as a handbook for life and science and history and psychology and gardening and cooking and... The Bible is so much more than that. It is about God's only Son who came to redeem me. That's the point and that's what I want to stick with. I would not recommend this book to most of my Biblicist friends. I do not feel that most of them are ready to really question their reading of scripture in an honest way. The text of this book is also highly academic and potentially inaccessible to a lot of people. 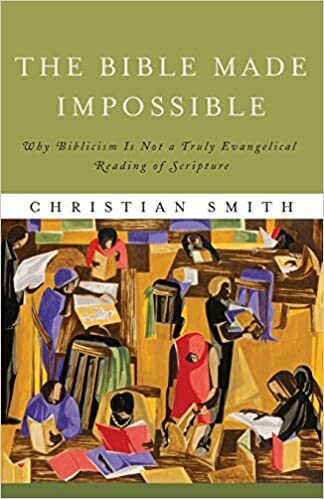 Granted, if my reader is ready to read with an open mind (and maybe an open dictionary) then I absolutely would recommend picking up a copy of Christian Smith's book. It may do you good.